Jim Henry's book The Blood Bankers, published in 2005, is one of the best ever (and perhaps the best) investigative exposés of the blood and guts of the operations of global private banks (or pirate banks, as some call them) in developing countries. These institutions aggressively fostered and encouraged vast illicit financial flows, making large profits and leading to many countries being saddled with unsupportable debt, while their élites who had gorged on the borrowing salted away their winnings offshore. In Africa, the problem was bad enough, as this study indicates. In Latin America, the scale was far larger. Henry's book mostly explores events in the 1980s and 1990s, but this latest story from Bloomberg shows how prevalent the practices remain. It is a superb story which looks at the case of Alexandre Caiado, who was raised attending country clubs and private schools in Curitiba, and was hired by Merrill Lynch so he could tap into his family contacts to gain new clients there. Caiado is now under arrest. "Prosecutors charged Caiado with arranging illegal fund transfers for Merrill clients -- part of what has become a four- year investigation into bankers helping clients secretly move undeclared money abroad to evade Brazilian income taxes. Caiado’s work at Merrill was part of a pattern in which bankers helped clients move undeclared money in and out of Brazil in ways that couldn’t be tracked by tax authorities, says Deltan Dallagnol, a prosecutor handling Caiado’s case." Caiado says he was just following orders. And the guy is mystified why he is in the dock. And here, in these comments, we see how just very far the world has fallen since the offshore system grew up. Respectable people, often the very cream of society, and the most exalted financial institutions, carry out these kinds of activities - and the problem has become so pervasive that its practitioners wonder how there can be a problem. There is a problem. There are several problems. They are called capital flight, mind-bending inequality, crushing poverty, political instability, and crime. 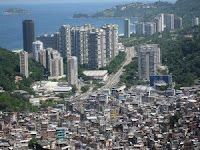 Caiado and his like may not be familiar with the poverty aspects, but hundreds of millions of people are. Financial institutions are intimately tied to a huge currency black market in Brazil,” says Sergio Fernando Moro, the federal judge in the case against Caiado. And Bloomberg cites Janice Ascari, a regional federal prosecutor in Sao Paulo, who shreds one of the common arguments about this problem: that this problem would fade away if only taxes were cut. "It’s not because levies are sky-high, Ascari says. A millionaire in Brazil is taxed at a federal rate of 27.5 percent, a smaller levy than in the U.S. and most European countries. Brazilian millionaires avoid taxes routinely because that’s what their families have been doing for decades and they know they can get away with it, Ascari says. And even if they’re caught, they would use the weak court system to prevent convictions or having assets seized." Here we have it. Wealthy élites, operating with great impunity and a sense that they are above the law, loot their countries, send it up to tax havens in OECD member state nations (or in those controlled by OECD member states) - and their co-citizens be damned. On the bright side, it is fantastic to see Brazil get tough on these pinstripe pirates.